The oath ceremonies were meant to be a display of unity like that in Karnataka in May. The bus ride together is seen as a show of opposition unity. 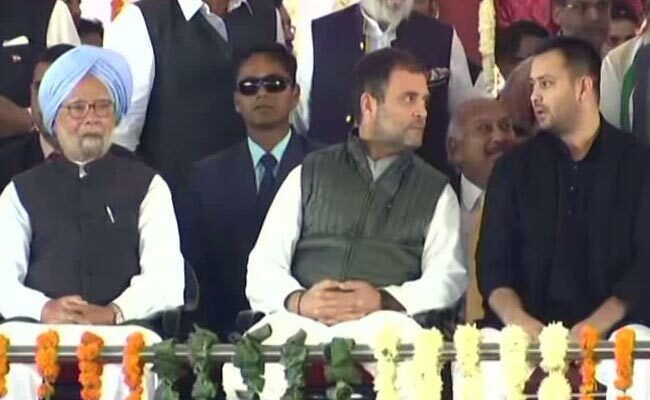 Rahul Gandhi sat in the front with former prime minister Manmohan Singh as he travelled with a busload of opposition leaders to three oath ceremonies, a day after a suggestion that he be the opposition's prime ministerial candidate for the 2019 national polls left many parties cold. 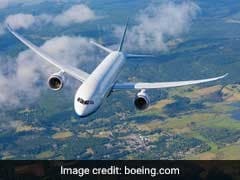 "Gathbandhan Travels" missed three prominent passengers - Mamata Banerjee, Mayawati and Akhilesh Yadav -- all of whom have reportedly objected to MK Stalin's proposal that Rahul Gandhi be the joint opposition candidate. But that is not the reason they gave for their inability to attend. Mr Stalin's idea followed Congress' victories in three big heartland states, Rajasthan, Madhya Pradesh and Chhattisgarh. The oath ceremonies were meant to be a display of unity like that in Karnataka in May, after the Congress and Janata Dal Secular formed an alliance against the BJP. The Congress this morning "turned down" Mr Stalin's offer, with its leader Ghulam Nabi Azad saying: "We will wait for the results next May". Kamal Nath, who was sworn in as Madhya Pradesh chief minister, told NDTV: "I am not sure if people will have a problem (with Rahul Gandhi)...Rahul Gandhi never said he insists on the Prime Minister's post. This has got to be discussed among all allies without any pre-condition and the Congress has to go along with that." 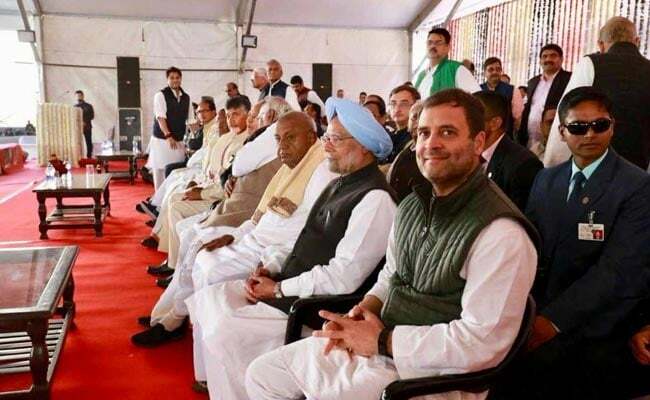 The Congress managed its photo-op with the rest of the opposition leaders; Sharad Pawar, Chandrababu Naidu, Tejashwi Yadav, MK Stalin, Farooq Abdullah, Kanimozhi, Praful Patel and Sharad Yadav were among the leaders who hopped oath ceremonies today from Jaipur to Bhopal to Raipur. Most of them were seen on the bus ride together in a photo tweeted by Rahul Gandhi from Jaipur. Sachin Pilot and Jyotiraditya Scindia, the young leaders who lost out in the race for the chief minister's post in Rajasthan and Madhya Pradesh (Sachin Pilot accepted the deputy Chief Minister's post), sat together. 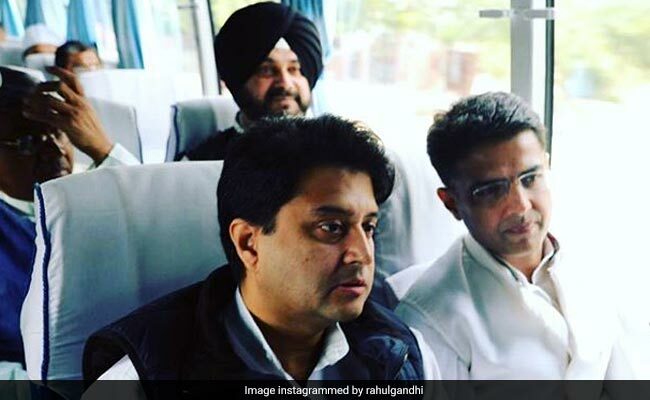 Sachin Pilot and Jyotiraditya Scindia sitting together in the bus. The leaders travelled on special flights to make it to all three events back-to-back. They were all ushered on to the stage at the ceremonies. Opposition leaders sharing the stage. For a section of the journey, Tejashwi Yadav, the son of RJD leader Lalu Yadav, joined Congress leaders Rahul Gandhi and Manmohan Singh on their flight. Tejashwi Yadav talks with Rahul Gandhi. All the leaders arrived and left together, even if not on the same flight. Even those who were sworn in got on the "bandwagon". Ashok Gehlot, after his swearing in, was spotted in Bhopal. Jyotiraditya Scindia, Madhya Pradesh leader, got a warm hug from his aunt Vasundhara Raje, the outgoing chief minister, as they met at Mr Gehlot's oath ceremony. 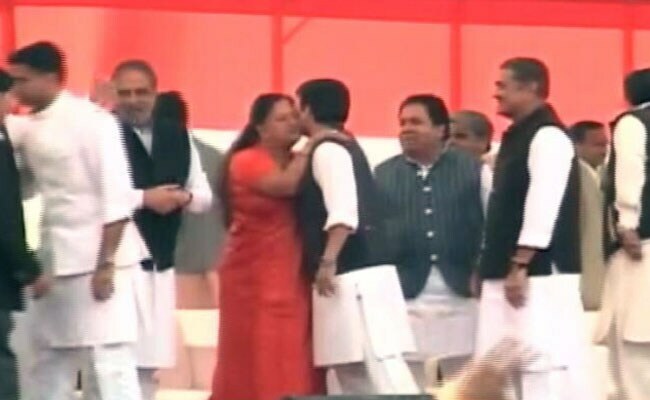 Vasundhara Raje embraces Jyotiraditya Scindia. "Happiness all around in the bus," was the tweet from the twitter handle @RahulMyPM. The Congress will hope the cheer lasts till the 2019 national election and its results.